Vane Weston is haunted. By the searing pull of his bond to Audra. By the lies he’s told to cover for her disappearance. By the treacherous winds that slip into his mind, trying to trap him in his worst nightmares. And as his enemies grow stronger, Vane doesn't know how much longer he can last on his own. But Audra’s still running. From her past. From the Gales. Even from Vane, who she doesn't believe she deserves. And the farther she flees, the more danger she finds. She possesses the secret power her enemy craves, and protecting it might be more than she can handle—especially when she discovers Raiden’s newest weapon. With the Gale Force weakened by recent attacks, and the power of four collapsing, Vane and Audra are forced to make a choice: keep trusting the failing winds, or turn to the people who've betrayed them before. 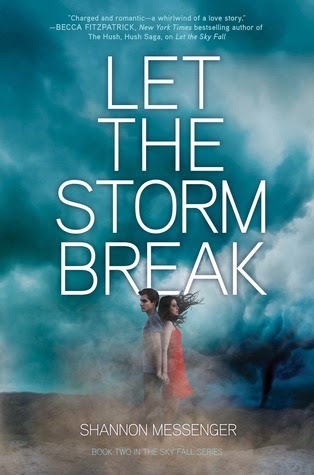 But even if they survive the storms sent to destroy them, will they have anything left to hold on to? Let The Sky Fall has been on my wishlist for so long and with each piece of new info I find out about this series, the more I just want to delve in. There aren't many premises alike Shannon Messenger's series and I think it's unique-ness makes it all the more coveted. Waiting on this one a lot. Are you waiting on "Let The Storm Break", like me? YES!!! I need this book! :). I haven't read Let The Sky Fall yet either, since I like reading series' together. :) Great pick! The cover in this entire series is just so pretty. I need to start it. I didn't know there was a "whirlwind romance" that I was missing out.